It has been said that children of today are the future for tomorrow that is why it is necessary that children learn how to protect and help the environment at an early age. Educating kids on how we convert waste into compost through the process of composting is one of the ways in getting them involved in helping the planet’s environment. Compost is a fertilizer that is obtained as a result of the composting process which is a method involving the usage of natural decay over biological waste created in our households. Materials usually used in composting vary from coffee grounds, leftover food and vegetables etc. Composting carries a number of benefits since we reduce the amount of waste we produce in our household thus falls under the philosophy of 3 R’s which is reduce, reuse, recycle. At the same time by reducing the waste we protect the environment from pollution and green house gases emitted from our waste that are created when we dump it in landfills. Finally by composting properly we create top quality fertilizer for our garden at no cost which is a great financial benefit! If you live in a city or have a very small garden then the process of composting might not be a good option for you. If you live outside city center areas and you have a large backyard that you enjoy gardening then composting might be an option that you would want to consider. All that you need to get started is a small initial investment to buy a compost bin and a small area in your garden to place it. Note that you can create your own bin by finding a proper size tin can and cutting out the bottom but since manufactured bins are not very expensive this might not worth the trouble. Having said that, you need to place your bin at an area where the bottom touches the soil so that decaying of the material you place inside can be initiated. Moreover, you need to make sure that you add the right amount of water in your composting bin in order for the process of composting to be properly carried out. Finally you need to make sure that the bin is ventilated and closed properly and in an area in your garden where wind will not tip it over since household waste tends to attract rodents. What kind of waste can be converted into compost? There is a number of materials that can be converted into compost such materials include leaves, fruits and vegetable scraps, flowers, grass cuttings, egg shells, bread. Never add glass, large wood branches, metal, plastics, meat scraps or any type of garden waste that has been sprayed with pesticides. 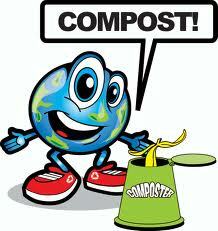 Kids by getting involved with composting they learn how to reduce and reuse waste. This is very important since we are usually preoccupied only with recycling which as a matter of fact should be our last resort when we cannot reduce and reuse. By having kids understanding at an early age the importance of the 3 R’s we secure the future of our planet. Furthermore, composting is an activity that involves some of kids’ favorite activities like playing with dirt and digging! Of course because of the messy play that composting involves we should make sure that our kids are always supervised when doing so. A first good step in getting kids introduced into composting is through the use and demonstration of pictures. There is a couple of reasons other than the quite known a picture is worth a thousand words such as the fact that getting compost takes some time which is usually 4 to 5 weeks. Given the fact that kids are generally impatient and not huge on late gratification getting to see the final output image helps out with building up some patience. There is number of aids that you can use such a PowerPoint presentations or a good old fashion search on the internet. Now that you have shown them the final product you need to thoroughly explain how the process of composting that turns garbage into a final useful product. Making your kids’ feel that they are performing a small scientific experiment usually captures their attention. Therefore, getting them involved in the process of setting up your compost bin and also setting up a schedule for the whole process of composting from mixing the pile to speed up the process and monitoring the quality of the compost usually helps in getting them excited about the whole project.